Cielo Blanco, or “white sky”—as it translates from Spanish—seems rather an apt name for a Mexican restaurant in overcast London. It opened in May, and, based in Clerkenwell’s culinary corner is the first London outpost for founder Ged Feltham and his team, following the success of their venture in Leeds. On entering, exposed bricks and wooden planks are seen lining the walls, with pretty black-and-white patterned tiles underfoot. Ornaments of Mary Madeleine in prayer with a bright light halo effect adorn a couple of the walls; ‘day of the dead’ style paintings grace the others. Pink lights with tassels hang by the bar, complementing the fuchsia pink stained glass window that separates the kitchen from the restaurant. The larger eating area has a combination of red leather booths, and wooden furniture. A large communal table and an oversized tree strung with lights reside at the back; a large skylight floods the restaurant with natural light. The vibe is convivial, colourful, and fun—as Mexican dining should be. We went at lunch and did not venture down to their basement bar where mescal, tequila, and agave spirits are served in the evening (but imagine that to be quite a draw for those seeking Mexican hedonism). The barbacoa markets of Oaxaca inspire the menu—there’s a ‘street food experience’, ‘sharing boards’, and ‘large plates’. A good choice of locally sourced super juices, like ‘Amarillo’ (made of yellow pepper, pineapple, fresh turmeric and lime) run alongside ‘Aguas Frescas’, which are refreshing Mexican fruit waters. The watermelon cooler—with watermelon, pear, lemon and agave—was pleasant but not memorable, perhaps since the weather was more ‘cielo blanco’. It probably will come into its own on a hot summer’s day. Whilst we waited for our food, we were given tortillas to munch on, along with a green jalapeno salsa that was moreishly good; we ordered some more. The street food section offered us the widest variety of choices. Chicken tinga tacos, and the Mexico-City grilled corn with chipotle sour cream and chilli powder stood out among the crowd, whilst the salmon quesadillas were disappointing—they lacked zing. The meat in the slow-cooked goat pibil flautas was scarce, and the sardine tostadas could have been injected with a little more heat. The sopes were similar to but thicker than tostadas, and fried to a soft, pliable texture. These were filled with confit tomatoes, epazote (a Mexican herb dating back to the Aztecs), and manchego. We wanted to love them but they lacked the "wow" factor we were after. Feeling full but keen to try one other offering, we ordered the slow-roast achiote pork and refried beans burritos. These were filling and had enough flavour from the delicately spiced achiote, but overfilled with rice. We’d have also prefered them to be juicier. Eager to finish on a high, we scanned the dessert menu. From among two varieties of ice cream, fresh ices (similar to sorbets, meant to cleanse the palate), and churros with chocolate, we opted for the last one. The churros were soft on the inside, crisp on the outside, and coated with cinnamon sugar—the highlight of the entire meal. Unable to force one last churro into our mouths, we left Cielo Blanco with bellies full and the sun shining. 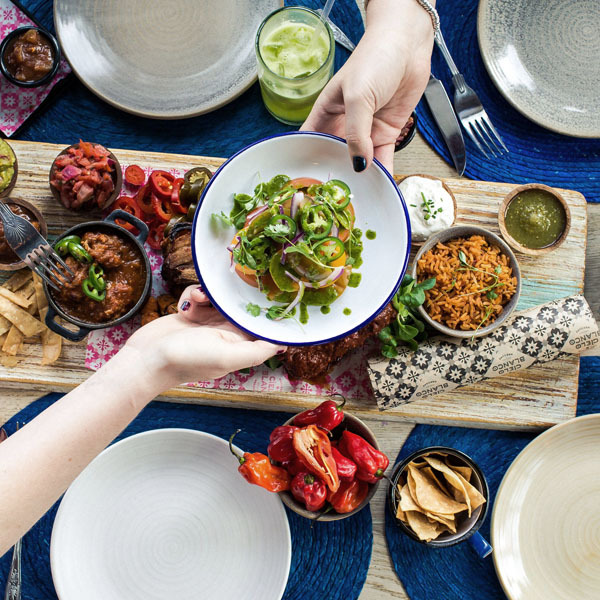 London has been educated rather well in Mexicana by others: especially Wahaca, which, despite being a chain, has a firm footing at this price point and is a justified default choice for many. This Exmouth Market novice will need to remember that it’s not on virgin territory.